A contractor agreement is a document which is used between a company and an independent contracting company or contractor individual. In many businesses, contractors play a huge role in accomplishing tasks and operations. Every time a company signs up to undertake a task which may require outside contracting help, a Contractor Forms is brought into the scheme of things. In the following lineup, we give you a rundown of some of the very popularly used contractor agreement forms. 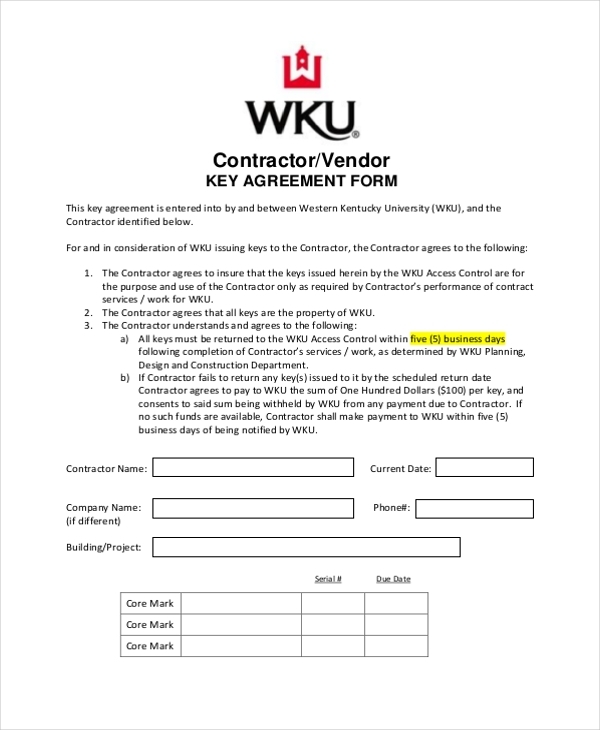 A general contractor agreement form contains a list of rules and regulation pertaining to which a particular task ought to be completed by an assigned contractor or contracting agency. In this form, the date of service, location of service, pay rate, estimated hours, travel costs, and total costs must be clearly specified. Signatures of the company and contractor must be established at the end of the document. 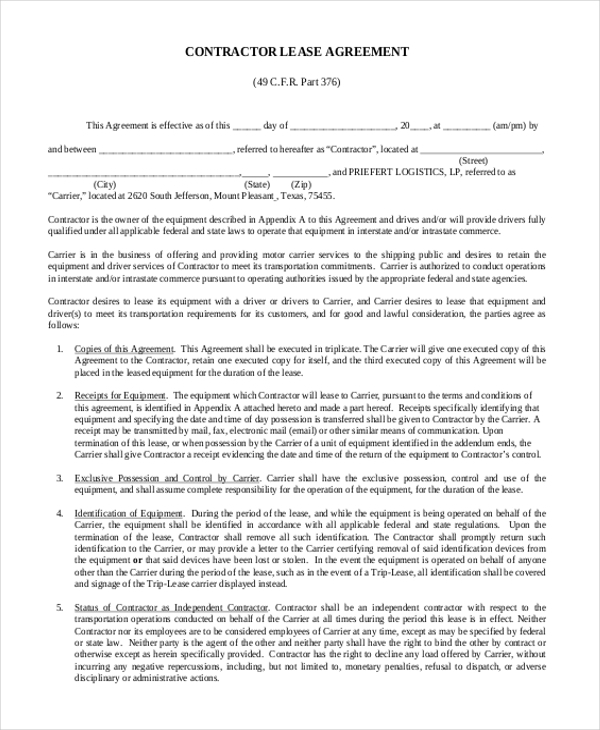 An independent contractor agreement form is utilized in scenarios wherein a company has assigned completion of certain services to a contracting company. The paperwork is populated with the names, dates and monetary details related to the undertaking. Following them, a lineup of guidelines and contingencies are elaborated in pointer format. If you’re hiring a contractor and subcontractor to perform certain services in your premises like home, office, school etc. 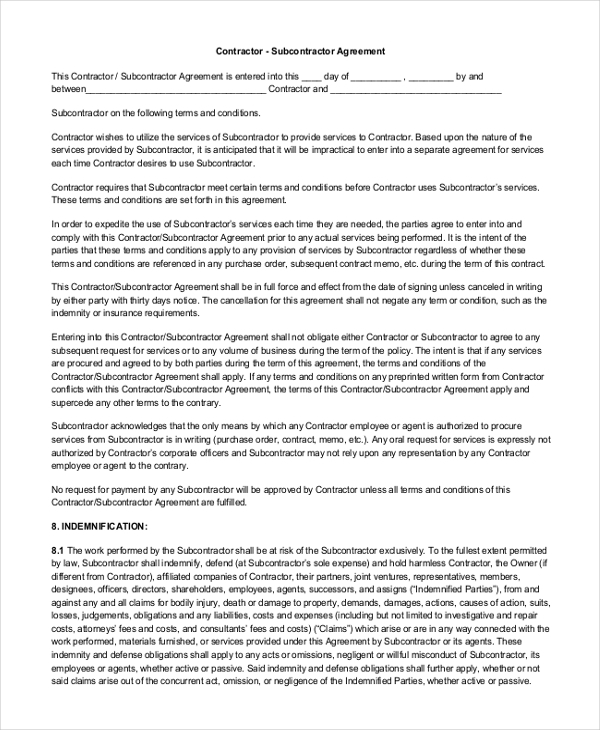 in such a case it is mandatory that a contractor-subcontractor agreement form is populated with the required specifics and information so that all the parties involved are bound and protected by the terms and conditions of agreement stipulated in the document. 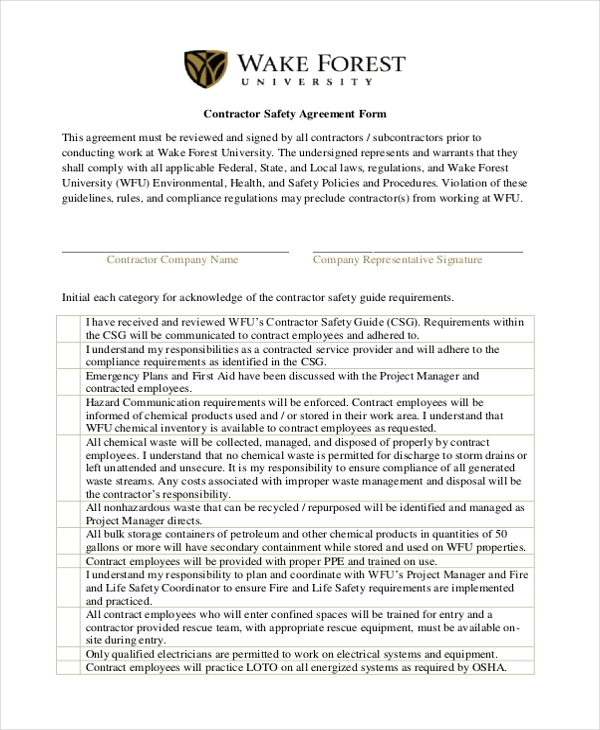 Prior to taking up a particular task or service, a contractor safety agreement form also needs to be defined with accurate information so that in the case of any injury or mishap, the contractor and the company can face and act in the situation on the basis of the guidelines and terms of agreement given in the form. If a contractor is leasing out certain equipment to other servicemen for a stipulated period of time, in that case, a contractor lease agreement input to good use. The names of the contractor and the party to whom the equipment is being leased need to be stated in the blank fields provided. The terms and conditions of the lease agreement are elaborately laid down thereafter. In many projects, companies and contractors are known to sign a contractor confidentiality agreement. As per the form, no part of the task or activity assigned to the signatory can be disclosed to any individual, company or authority. Depending on the scale and complexity of the project, guidelines of confidentiality need to be specified accordingly. In case a cemetery needs maintenance tasks, the authorities are likely to hire a contractor to perform the services. 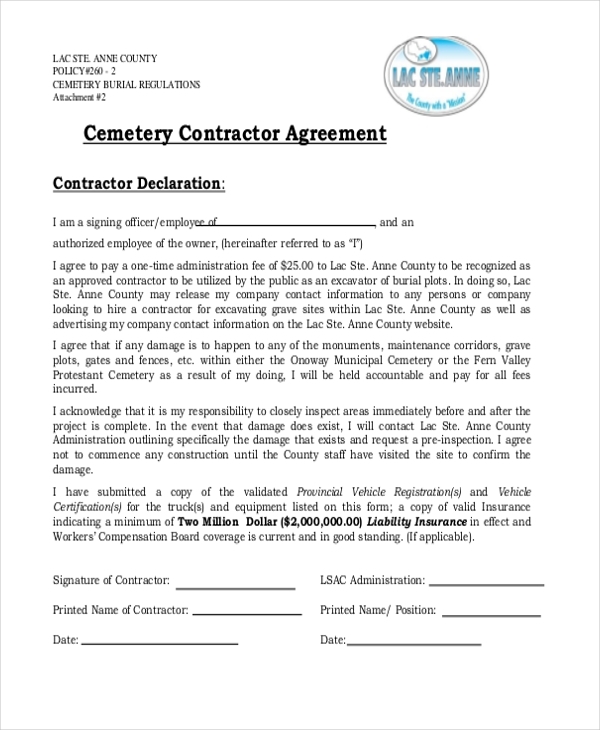 After the negotiations are through, a cemetery contractor agreement is established having the name of the cemetery, its proprietors, contractors are specified, along with the date and signatures of the parties involved. The form states a description and extent of duties and tasks the signatory contractor is expected to perform and fulfill. 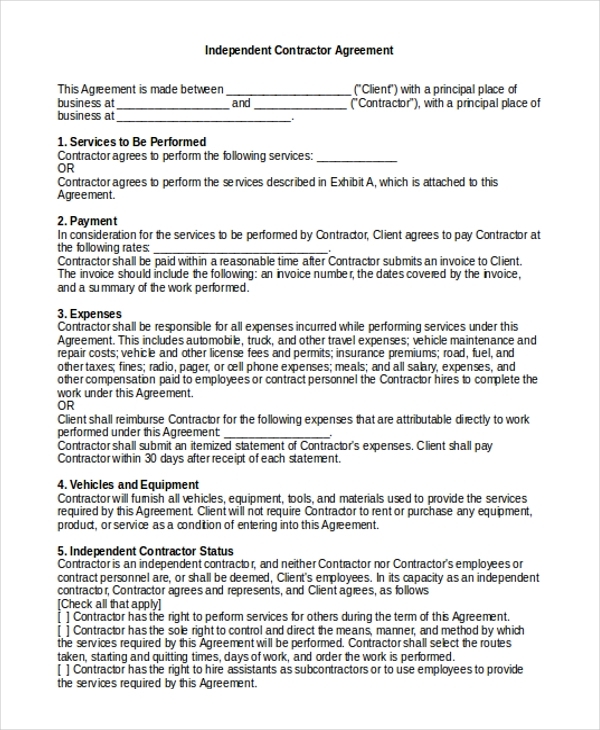 A contractor services agreement form is a legally-binding document wherein a company must list out the services of the contractor company is expected to commence and complete. The date, estimated hours, cost paid and payable must also be clearly indicated. In case a contractor allotted keys of certain premises to perform a certain contracting duty, a contractor key agreement needs to be signed. 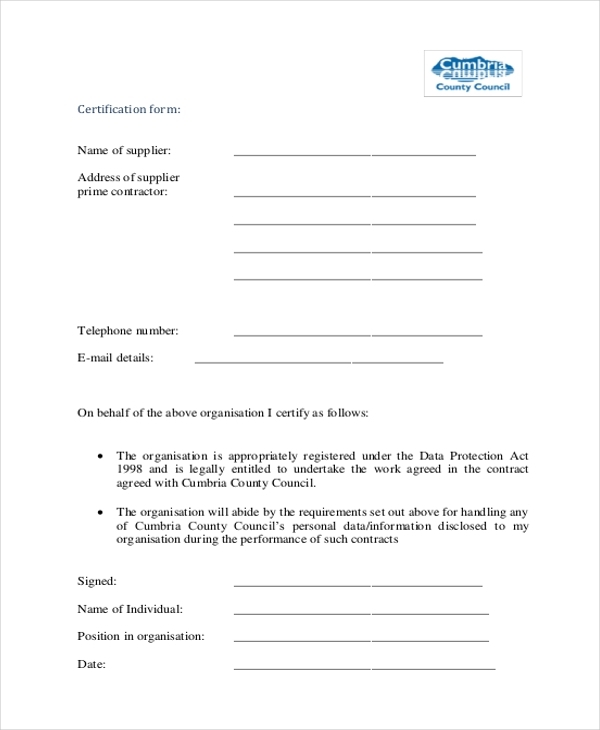 The document contains terms and conditions, the name of the contractor, current date, company name, phone number, company name and signature of the contractor. If you’re hiring a contractor for the first time, it makes total sense to have paperwork in the middle of the dealing. This is a healthy practice because a contractor agreement form ensures that both parties, the client and the contractor have understood and reached an understanding about the terms and conditions which have been tabled in the form. Even if you’re a client who hires contractors frequently, it is advisable that you do not leave anything to chance, and always use contractor agreement forms for all your contracting endeavors so that you have to face no trouble before, during or after a contracting task. You may also see Contractor Invoice Forms. 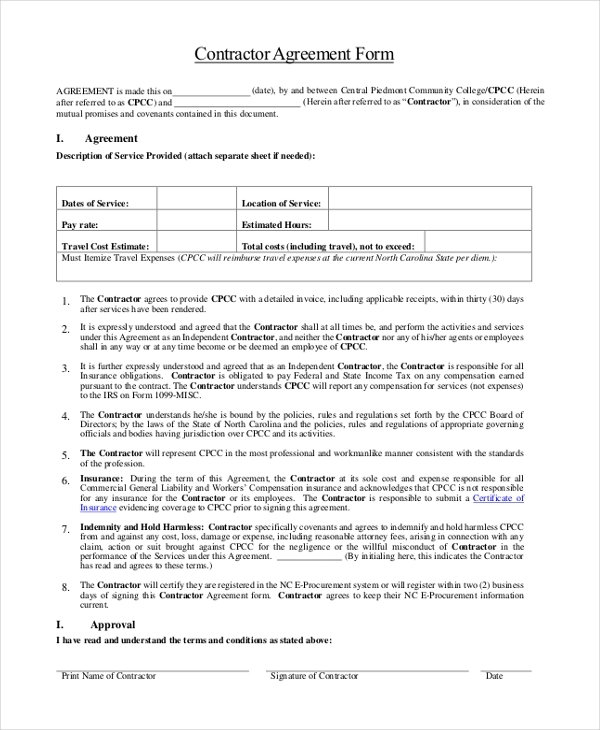 For users hoping to design contractor agreement forms on their own, the good is that they can take inspiration or use readymade contractor agreement forms. These are available in various avatars on websites on the Web. The forms are well-designed and edit-friendly. Users just need to download a form of their choice and edit it in any way they wish. Most often the forms are available in either PDF, MS Word or MS Excel format. 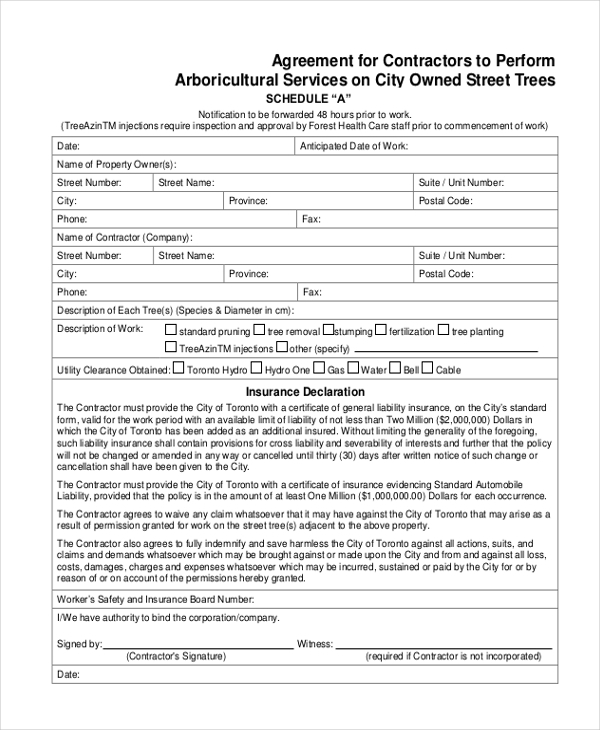 You can also see Independent Contractor Forms. Be it residential or commercial contracting services, contractor agreement forms are a big plus in every dealing of this kind. The forms provide clarity and credibility to the parties involved. Of course, the format may slightly differ depending on the task at hand, but the purpose of all contracting forms is the same.